Before the last half of the 19th century, most people throughout the world washed and ironed their own laundry, or had that chore done by domestic servants who also cooked meals and took care of young children. 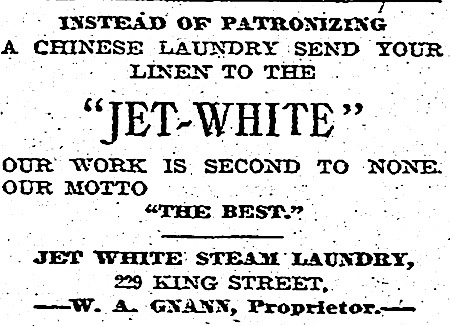 Chinese immigrants in the U.S., and many other countries, may have “created” the laundry business. This occupation was not one that Chinese immigrant men practiced back in China where, as throughout the world, laundry was relegated to women. Despite the unfamiliar, and probably humbling and humiliating, nature of this occupation, Chinese men turned to it out of necessity because racial discrimination closed them out of other occupations. Chinese came to dominate the hand laundry business for decades in the last half of the 19th century before the rise of steam laundries operated by whites. 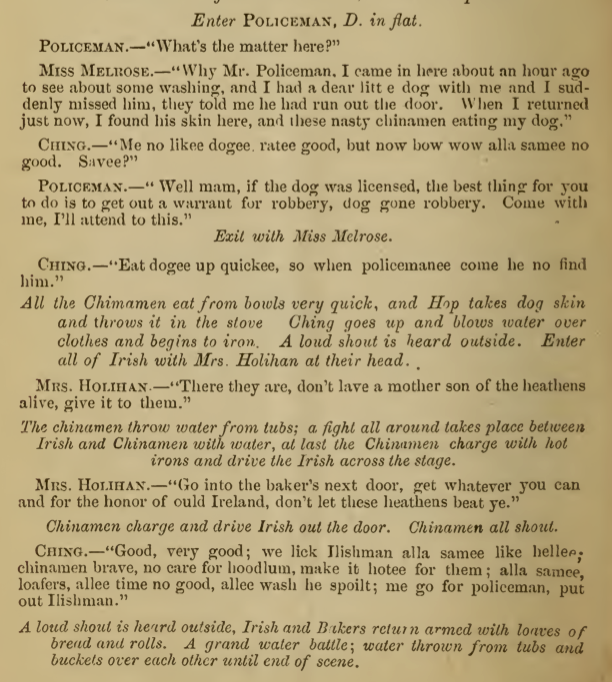 However, opposition to Chinese laundrymen came from two groups that were involved as domestics doing laundry for households, Irish and black washerwomen. 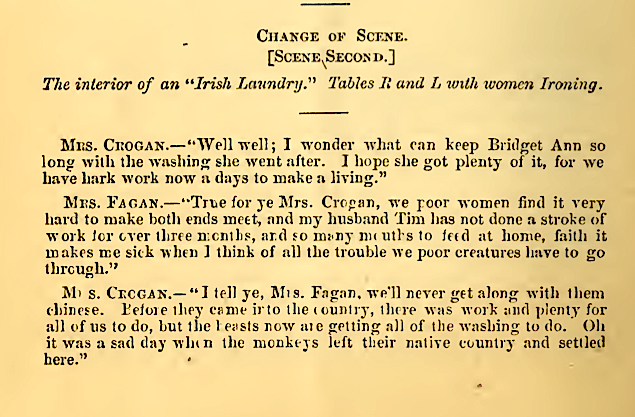 In many eastern cities, Irish washerwomen supported their families by taking in household laundry, often because their husbands were unemployed. 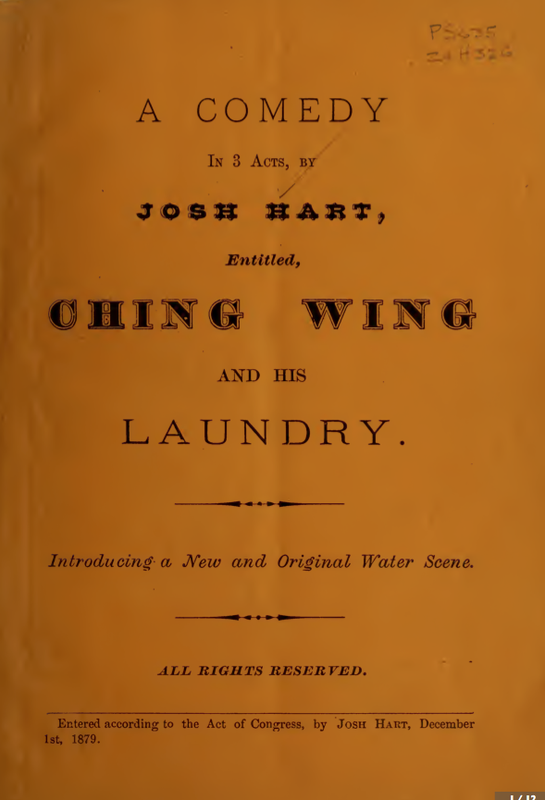 The growth of Chinese laundries was a threat, as illustrated by an 1879 play by Josh Hart. The Irish return in numbers and a brawl breaks out between them and the Chinese laundrymen. In Lapeer, Michigan, a Chinese laundryman was given three days by black washerwomen to leave town. They threatened to cut off his queue unless he complied. When a Chinese laundryman showed up in Albany, Georgia, in 1899 he received death threats from black washerwomen unless he left town. Eventually these conflicts died down, in part because the Chinese laundries focused on men’s work clothes while black washerwomen dealt with washing family and household items. As the nation moved from an agrarian to an urban society in the last half of the 19th century, demand for laundry services increased and gave rise to more commercial laundries. Chinese hand laundries relied on manual labor to wash and iron clothes. Irons were heavy, 8 1/2 pounds of iron, that had to be heated periodically over hot coals to a temperature that was not too hot to avoid scorching the clothes. 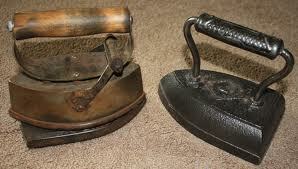 As the temperature dropped, the irons had to be reheated after a short period before they could be effective. 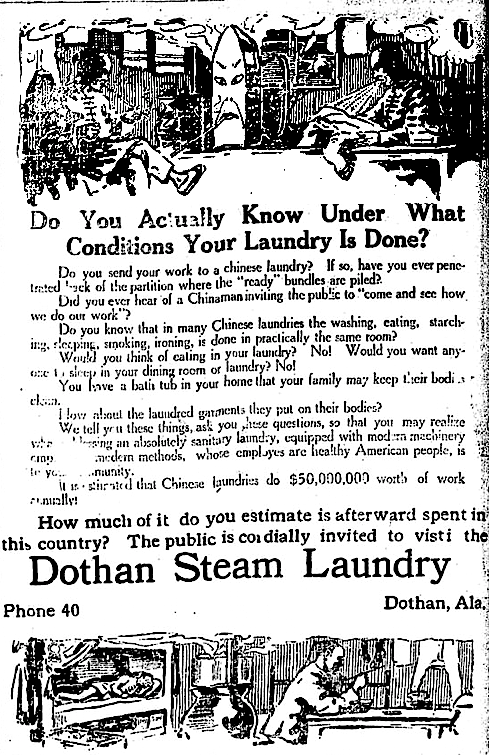 A 1915 Dothan, Alabama, white laundry went even further to oppose Chinese laundries. It used a no holds barred advertising campaign with images depicting Chinese laundrymen smoking opium and sleeping and eating in the laundry. The text of the ad below poses questions about whether customers want to have their laundry done in a Chinese laundry where eating and sleeping occurs in the same room as the clothes washing is done. A concern is also raised over the fact that the Chinese send most of the money they earn back to China rather than spending it locally. In 1879 at a time when Chinese and their laundries were generally reviled across the U. S. and Canada, there were places which welcomed them. 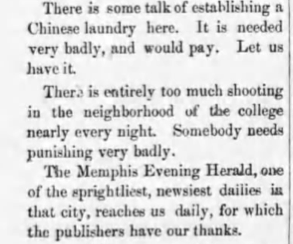 For example, in Milan, TN., the local paper opined how welcome a Chinese laundry would be and hoped one would come to town. 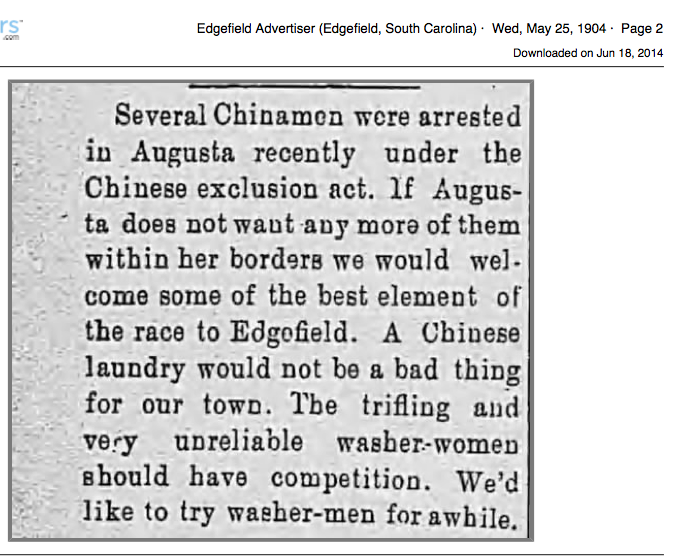 Edgefield soon got its wish, but didn’t need to have one of the Chinese dispatched from Augusta. 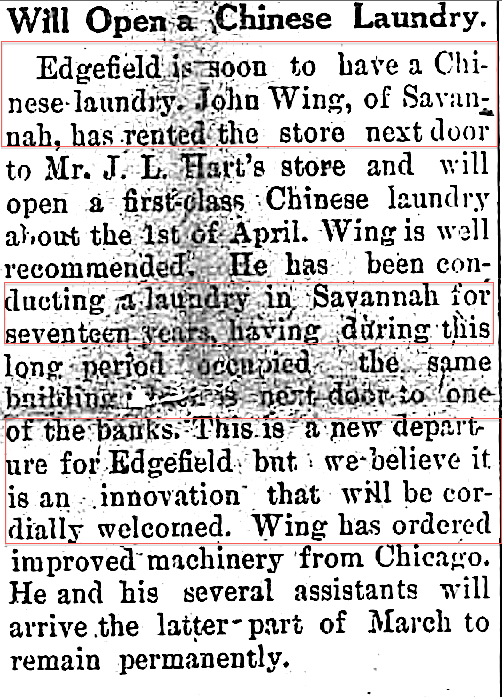 The news was that John Wing, of Savannah, an experienced laundryman of 17 years had already ordered improved machinery for the opening of Edgefield’s first Chinese laundry shortly. 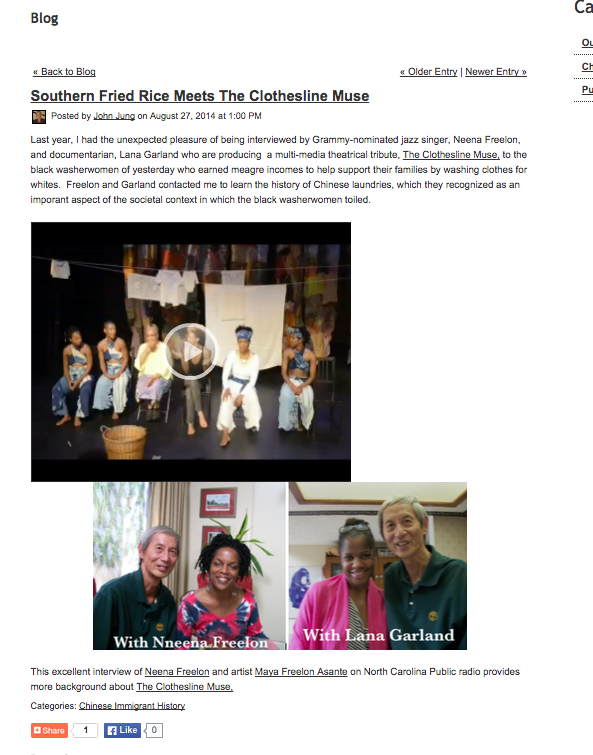 Madison, Florida welcomed “a full fledged Chinese laundry” operated by “Wun Lung” (supposedly his name) from China scheduled to open in a few days. 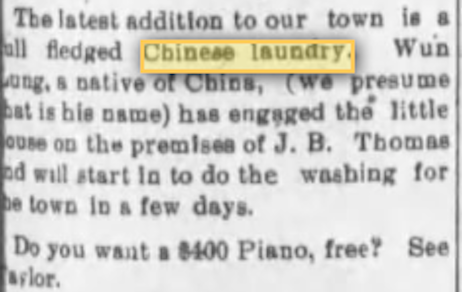 In 1914, Welch, West Virginia, was delighted to “at last” have Sam Kee open a Chinese laundry next to the livery stable. They could also have bragging rights if they had the first Chinese laundry in North Carolina. Although Chinese laundrymen were being driven out of western states at the end of the 19th century, they increasingly moved to the South and East in search of better places to set up business which welcomed them, even if for questionable motives. 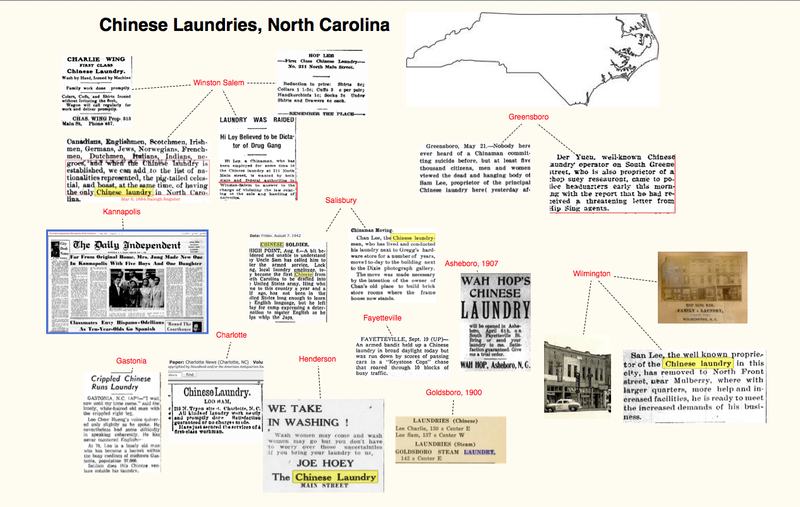 When I was growing up in Macon, Georgia in the 1940s, my parents operated the only Chinese laundry in town. As a child, the thought or question never entered my mind once as to whether there had been any Chinese laundries or other businesses there before my parents came to Macon in 1928. It was not until 1956 on the eve of my father’s retirement and move to San Francisco when the local newspaper published a commentary with a headline, “Not A Chinese in Our Town for the First Time in A Century,” that I ever considered the possibility that other Chinese had been in Macon before 1928. 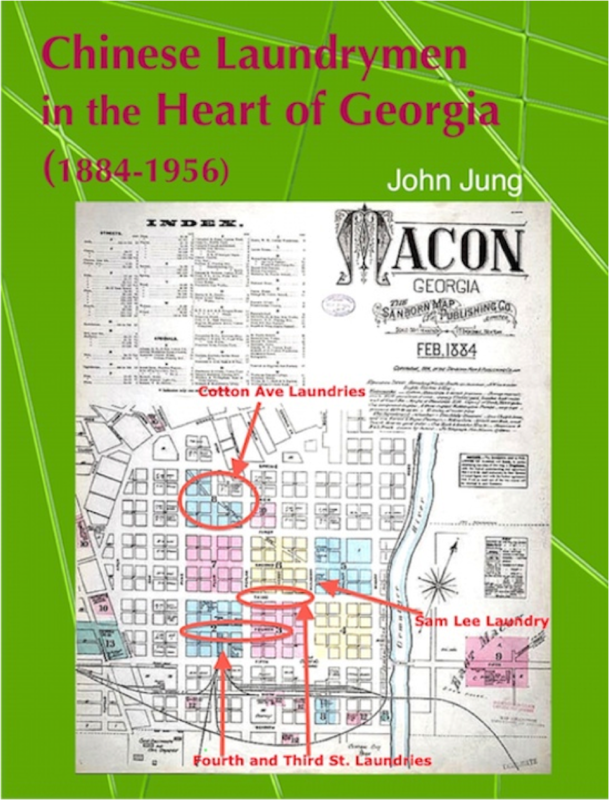 As I was only 15 years old then, this realization piqued by interest, but only momentarily and it was not until about 60 years later that I decided to search archival resources to learn what I could about these earlier Chinese in Macon. Much to my surprise, I found over 30 newspaper articles dealing with the dozen or so Chinese men who had all operated laundries in Macon from 1885 until 1928 when my parents came from China. There were no Chinese women or children during this period so my mother was the first Chinese woman and I and my 3 siblings were the first Chinese children born in Macon. I report my findings in this downloadable linked document, Chinese Laundrymen in the Heart of Georgia (1885-1956). 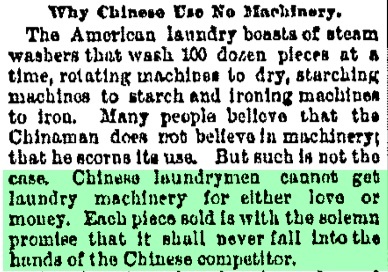 A small news item in 1869 reported that Chicago was not only about to get a Chinese laundry, but a great one. 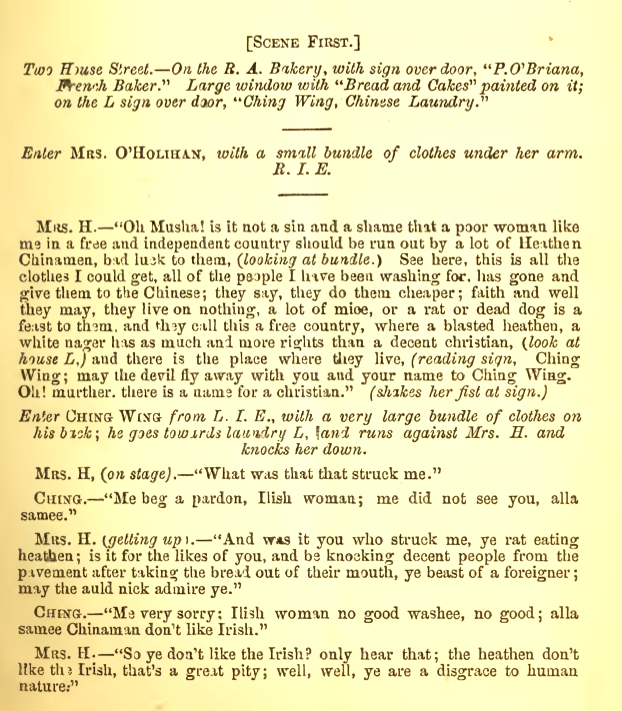 Chicago merchants were recruiting 100 men from San Francisco, where many Chinese men work as house-servants in place of Irish women, referred to as “Bridgets.” However, in Paul Siu’s authoritative research, The Chinese Laundryman, the first Chicago Chinese laundry at 167 West Madison Street did not appear until 1872, a year following the Great Fire. Perhaps, that date is close enough to the originally predicted date with the fire delaying the planned 1869 opening. 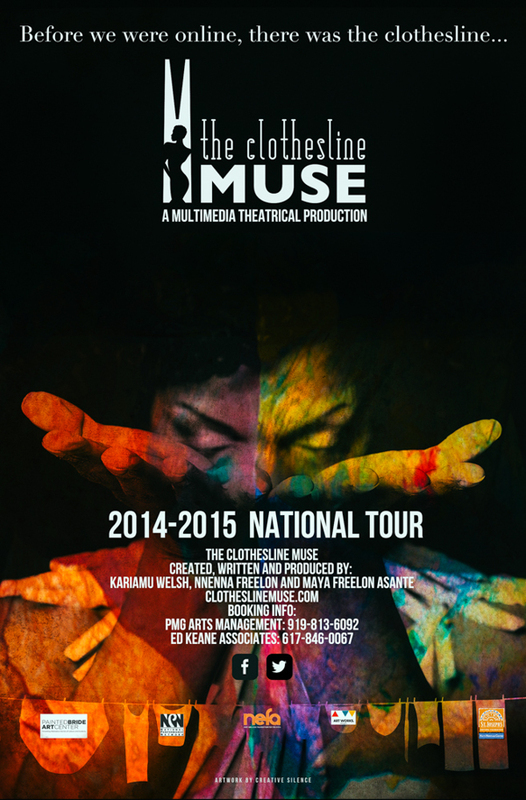 Chinese laundries grew rapidly in Chicago as in other places across the country. Siu reported that Chicago had 18 Chinese laundries in 1874-5, and that number doubled by the end of the decade. However, the growth did not mean that the Chinese were welcome. Often easy targets of assault and robbery, the laundryman did not have an easy life. One of the more unusual and sinister attacks on laundrymen occurred in Chicago in 1884 when five young girls, aged 14-16, who called themselves “The Chinese Five” chloroformed Chinese laundrymen before robbing them. They were arrested and fined $100 each, which was suspended on condition of good behavior. A number of Chinamen were arrested as well, presumably because some of the girls admitted “visiting Chinamen” in the back of the laundries while the others chloroformed and robbed the proprietors.